I have no clue what happened at the Gold Street Gossip Shop last Sunday, much like every other week, really, but this was at least partly on account of the Captain, meself, Doug Haircut Kuhn and Kevin all sneaking into the Comma Jam Session in downtown Castlemaine, seething metropolis of the North and home to several people. And a damn fine session it turned out to be – kicked off in style by a somewhat svelte suave and sultry songstress, Meg Corson, accompanied by Civil Bop, who despite their collective age of about three and a quarter, keep getting better and better. We were actually there for a Planning Session for the 2015 Castlemaine Jazz Festival, all of which will go live, website-wise, any day now. Meanwhile, back in the dusty back alleys of an untunnelled Collywobble, could fine music be heard? I thought not, Jam session must have run as usual. Spiffin! Don’t forget the Jammers bash next Sunday. Toodlepip! The Annual Jammers pre Christmas bash kicks off in the Gold Street Gossip Shop Atrium at 1.00pm this Sunday December 14th for those jammers desirous of a light luncheon, with what we laughably refer to as music starting shortly thereafter. Piss elegance may not be the order of the day, but you should at least start with good intentions. You may expect an afternoon of ballad bashing, bossa bungling, standards mangling, interspersed with malicious gossip, slander, outrageous lies and innuendo. There will be a separate room for innuendo. It is not beyond the bounds of possibility that a little jazz will be thrown into the mix. In this case, try and keep a straight face, and do not call the Fire Brigade, as it will generally self extinguish in no time at all. You are encouraged to bring wives, husbands, partners, children and grandparents, but they are not to be eaten before 4.00pm. The whole shebang is expected to descend into a shambles some time after 6.00pm, so there will be plenty of time for those wishing to play. Feel free to enjoy yourselves, but preferably in private. Enthusiasm essential, charts a bonus, performance anxiety optional and competence to be well concealed as a kindness to others. The last Jam of the year – see ya there? It is all going rather well, although sometime fairly soon, the drummers are going to realise that there isn’t room for drums… but after last week’s smooth as perfomance by Sevil Sabah, who cares! This week, we are throwing Mademoiselle Sonia to the lions; Doug “Haircut” Kuhn, meself and quite possibly Captain Chaos himself will be denying all responsibility in the background. The Laika is a classy little cocktail lounge at the beach end of Fitzroy Street, St Kilda and the tres chic Mme Sonia will be doing her eclectic mix of bebop toons, French ballads, gypsy jazz and maybe even a song in Mandarin. Quite what the locals will make of that remains to be seen, and you can see it too by dropping by…she would love to see you there. The Lunatic Soup Lounge last Sunday: sweet! Sunday arvo at the Leinster can be a hit or miss affair. After last week’s shenanigans, one could hardly have thought this would turn out to be much at all. And for starters, it wasn’t… but as it turns out, this was about as enjoyable an afternoon as I can remember – the regular crew, ably lead by Captain Chaos himself, all got up and boogied, or sat back and gossiped over the occasional cooling draught, as they are wont to do. Doug Kuhn, Colonel T of the Fourth Light Punjab Horse, Noel the Sax, Ben Stewart, Is Don Is Good, Monsieur Sebastien, Peter Cole, Kevin the Krooner, Glen (Il Duce to those in the Know), Bob the Piano, Curtis at his debonair best, the Divine Miss Smith, Ivan Five String Bass, Jason The Hat, trumpets, chord wranglers, drinkers, gossipers, the lightly medicated and confused… all conspired to produce an afternoon of aural delights that occasionally veered into the dangerous waters of real jazz, but in a good way. Mme Hortense, together with her lifelong brief acquaintance, Madge, (Altona’s finest and slapper to the stars) wish to invite you, as a regular reader of this august organ, to the Annual Jammers Christmas Bash, to be held at the Gold Street Gossip Shop and Tea Rooms on Sunday 14th December. The plan is a for a 1.00pm start with a spot of lunch, followed by an afternoon of ballad mangling, bossa bashing, bad blues and trainwrecks galore, in the finest traditions of the Jam. Stuff it, if you do turn up, you could even play a little jazz. Just don’t make a habit of it, as that sort of thing can frighten the horses, sets a bad example for the kiddies, and could lead to the downfall of Society As We Know It, if big boy Tony doesn’t get us there first. We will be taking over the Atrium for the afternoon, and absolutely anyone is invited – you can tell it is going to be classy. 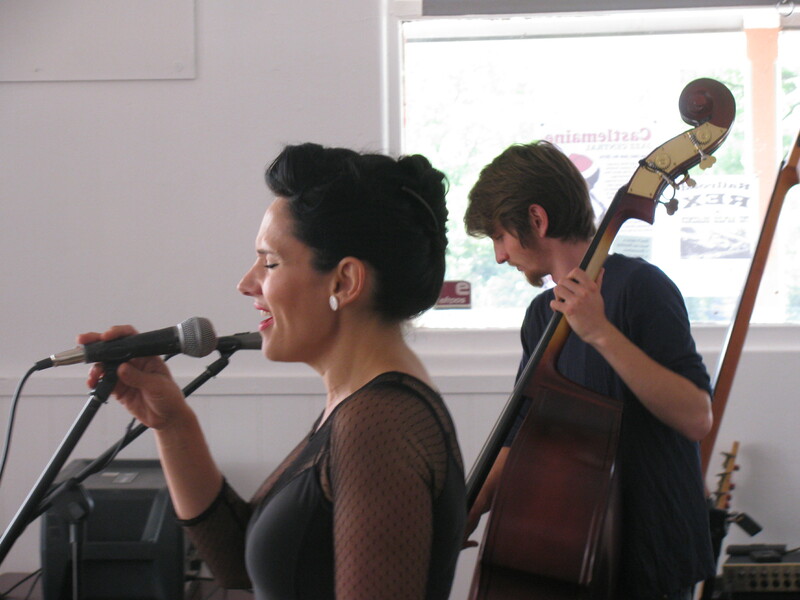 ..
Sevil Sabah sings the Laika, 6 Fitzroy Street, St Kilda, Friday 4th December from 7.30pm.